Happy Saturday everyone! A yummy little recipe to kickstart the weekend with. Jack actually started making these every evening for his breakfast the next day so I took inspiration and put my spin on them, but in fairness, credit goes to him! 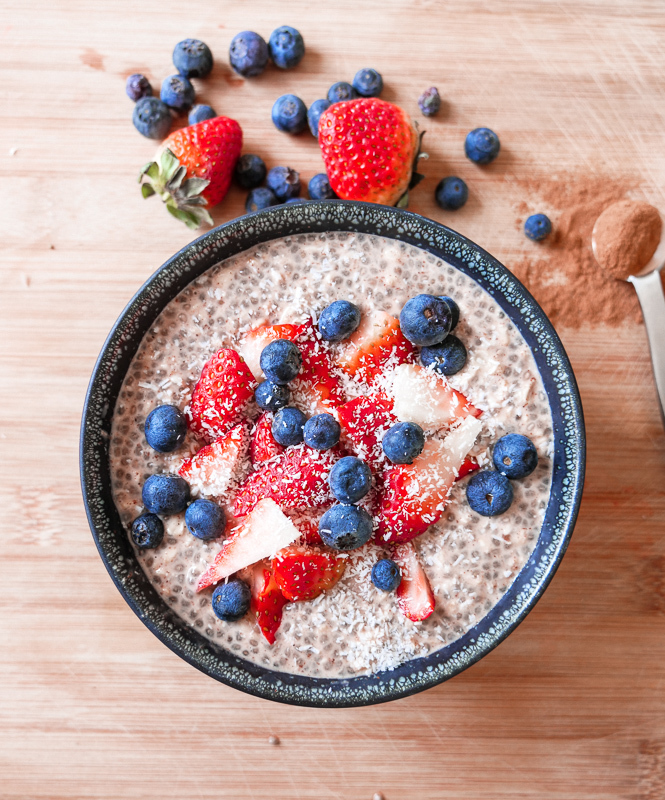 It’s packed full of protein from both the protein powder itself and fiber-rich chia seeds and has a B-E-A-U-TIFUL chocolatey rich taste to it :) The soaked oats will give you your sustained energy hit for the morning and well, to be honest, it’s just the perfect hassle-free, prepare-in-advance breakfast! We normally just add all the ingredients to a tupperware box, mix them together and leave in the fridge overnight, but, as I try to dub myself somewhat of a foodie blogger, I thought I best make a little effort for you and put it in a nice black bowl. Do we like!? 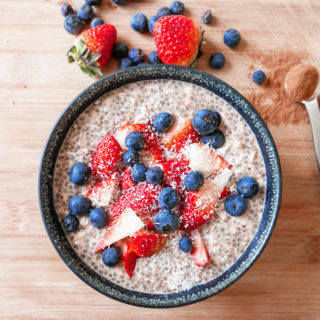 If you’re always on the go and find you tend to reach for unhealthier breakfasts because of time limitations, this will undoubtedly be your new go-to. 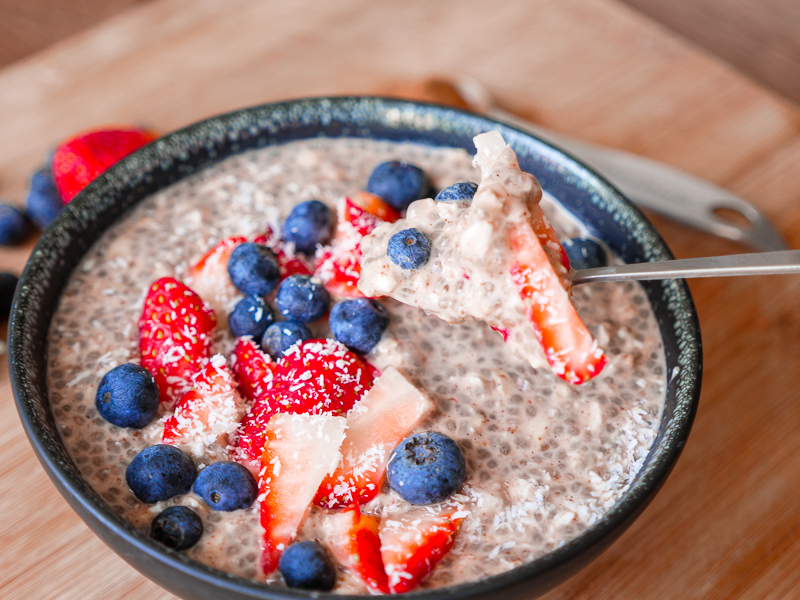 And if that wasn’t handy enough, these overnight protein oats are also packed with antioxidant-rich cinnamon which gives a lovely subtle and sweet taste to them. Add all the ingredients to a large bowl or tupperware. Mix well with a hand-held whisk or fork until all combined. 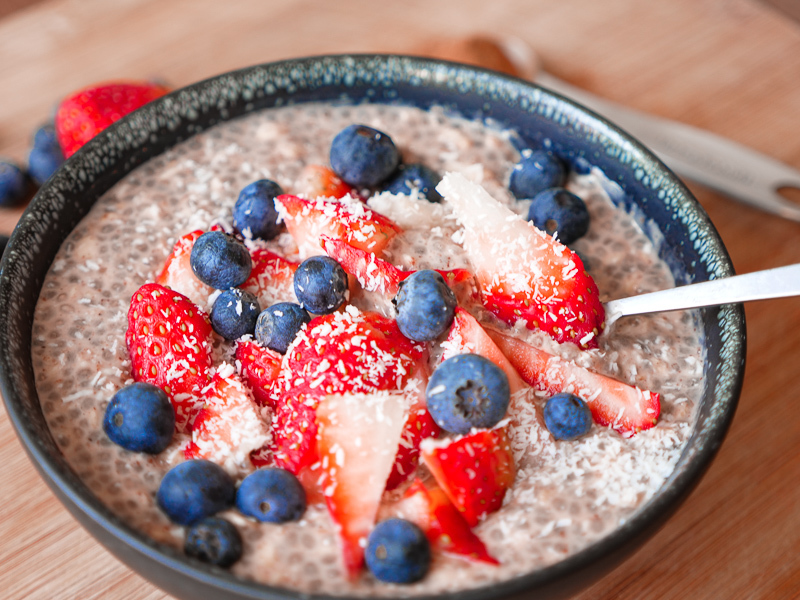 Top with fresh berries and desiccated coconut when you're ready to serve! By Carly Neave, April 21, 2018 Hello and welcome! I'm Carly, originally from London but currently enjoying a little adventure in Dubai. A travel and wellness blogger exploring the world one step at a time. Think fabulous food at undiscovered gems, unique destinations, skin care obsessions and so much more. This is my life, I hope you enjoy the ride!